The popular resurgence of the turntable may be surprising to some, considering the wide availability of digital music, however those who have experienced vinyl know the qualities that make it a superior listening medium. There have been loads to advancements when it comes to components and production, yet the basic science of how a turntable works has remained relatively unchanged. The main principles behind turntable technology where needle meets vinyl has remained essentially the same since Thomas Edison invented very first phonograph (translated from the Greek as “sound-writer”) in 1877. True to its name, the phonograph literally etched a direct representation of sound into a tin foil wrapped wooden cylinder. Edison spoke into a large horn to funnel the sound of his voice to a needle that rested against this cylinder. The concentrated vibrations of the sound caused the needle to vibrate accordingly against the cylinder, and as Edison cranked a handle to rotate the cylinder, and the needle moved up and down to cut a shallow groove into the foil. When Edison spoke softly, the needle barely scratched the surface, but when he spoke more loudly, the needle delved deeper. In short, the needle produced a groove that translated the sound of his voice into a mechanical form. To play back this recorded sound, Edison simply reversed this process, re-positioning the needle at the start of the groove and cranking the handle once more. As the needle ran along the groove it had previously cut, it jolted up and down to create specific vibrations. The noise produced by these vibrations was then amplified by the horn to recreate the sound of Edison’s voice in a somewhat scratchy but nevertheless lifelike fashion. 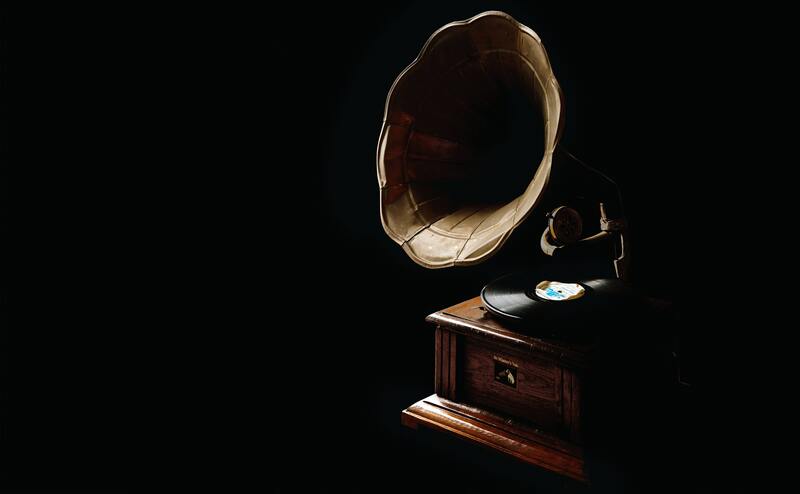 Although it trades Edison’s foil-covered cylinder for an acetate master and individual commercial units of vinyl, the modern record production process relies on the same sound-producing grooves as the prototypical phonograph. But, of course, the unwieldy and impractical Edison horn has gone the way of the dodo. The basic components of today’s turntable systems combine the warmth of the original phonograph with high-fidelity sonic clarity that rivals the latest digital music formats. Let’s take a closer look at each element and component of this system to see exactly how the magic happens. Although it comes in a variety of shapes and can be composed of a variety of materials, the essential function of the turntable base remains the same. In short, it contains all the moving parts that makes the turntable run. These parts include a motor that uses electricity to power a direct drive or belt drive system. This system, in turn (no pun intended), causes your favorite record to rotate at just the right speed (typically either 45 or 33 1/3 per minute) to play music at just the right tempo and pitch. The surface upon which the record rests, the platter is the disc-shaped component that spins under the influence of the turntable motor. Because relatively heavy materials are highly valued for the construction of the platter, most higher-end turntables on the market are comprised of ultra-weighted aluminum. Lighter platters may allow the vibrations from the motor to rattle records as they play, resulting in skipping or generally unsteady sound. Other platter materials such as acrylic are used to further dampen vibrations and help to maintain consistent speed with their added mass that creates more inertia during playback. Platters are generally topped by a rubber, cork, felt, or leather mat that help keep the record firmly in place and protect it from scratches. Each of those materials have unique properties that impacts resistance to static electricity or vibration dampening. Attached to the base and generally mounted to the side of the platter, the tone arm can be raised/lowered and moved laterally to access any part of the record surface for playback. The movement can either be accomplished manually (by lifting and placing the tone arm with a fingertip) or, in the case of some turntables, automatically. Often referred to as the “needle” (reminiscent of the essential component of Edison’s original phonograph machine), the modern stylus is a tiny crystal that is typically composed of sapphire or diamond and mounted on a flexible piece of metal. Just as in the Edison system, the stylus jumps up and down to reproduce the precise sonic vibrations that have been recorded within a rotating groove. But while Edison’s phonograph was entirely mechanical, relying only upon a giant horn to amplify these sonic vibrations, the modern turntable converts sonic vibrations into electromagnetic signals. By mixing mechanical and electric technologies, turntables are able to produce sounds that are far louder and much clearer. Mounted at the end of the tone arm and housing the stylus, the cartridge is the essential component that bridges the mechanical and electromagnetic spheres. When the stylus moves up and down in the groove of a record, it is the cartridge that receives the vibrations. These vibrations are then translated into electrical signals through one of two technical modalities. In some cases, the cartridge contains a piezoelectric crystal that is comprised of a unique material that releases an electric charge in response to applied mechanical stress. In other words, each time that the stylus moves, it gently wobbles the crystal to generate an electrical signal. Cartridges that do not contain a piezoelectric crystal use tiny electrical coils and a magnet to convert sound vibrations to electric signals. As the stylus vibrates, it pushes the magnet up and down past the coil, producing electrical signals from mechanical movement in much the same fashion as the piezoelectric process. The electric signals produced by the cartridge are fed via wires down the tone arm to a preamplifier that boosts them to the correct amplification (or loudness) level for output to a traditional stereo amplifier or audio system. These preamps can be external or built directly into the base of the turntable. These stereo components should be familiar to everyone who has owned and/or operated a home stereo system. The typical commercial amplifier can input signals from any number of audio components (MP3, CD, and tape players as well as record players) and amplify these signals to an appropriate level for transference through the speakers, which actually produce the sound waves that you actually hear. Of course, you can pump up these sound waves to whatever level your jam requires with a turn of your volume knob. In the end, the technology for playing records has not changed drastically since its original conception. While there certainly have been advancements along the way for recording music and manufacturing precise components to improve playback, the overall science behind turntables has been fairly constant. No need to mess with perfection.